Disneyland, located close to my home in Southern California, calls itself “the happiest place on earth.” However, after my eighth visit to Fiji, I have decided that Fiji is really the happiest place on earth. The Fijians always seem to have a genuine smile on their face and greet friends and strangers alike with a friendly “Bula” (hello). They also love to sing. The Fijian population is racially mixed. The indigenous people are Melanesians or Polynesian-Melanesians. In the late nineteenth century, the British brought in East Indians and Chinese to work on the coconut and sugar plantations. Many of them stayed in Fiji. Indo-Fijians generally live in towns, while many of the indigenous Fijians live in villages each with its own chief. Fiji was a British colony from 1874 to 1970, when it gained its independence. 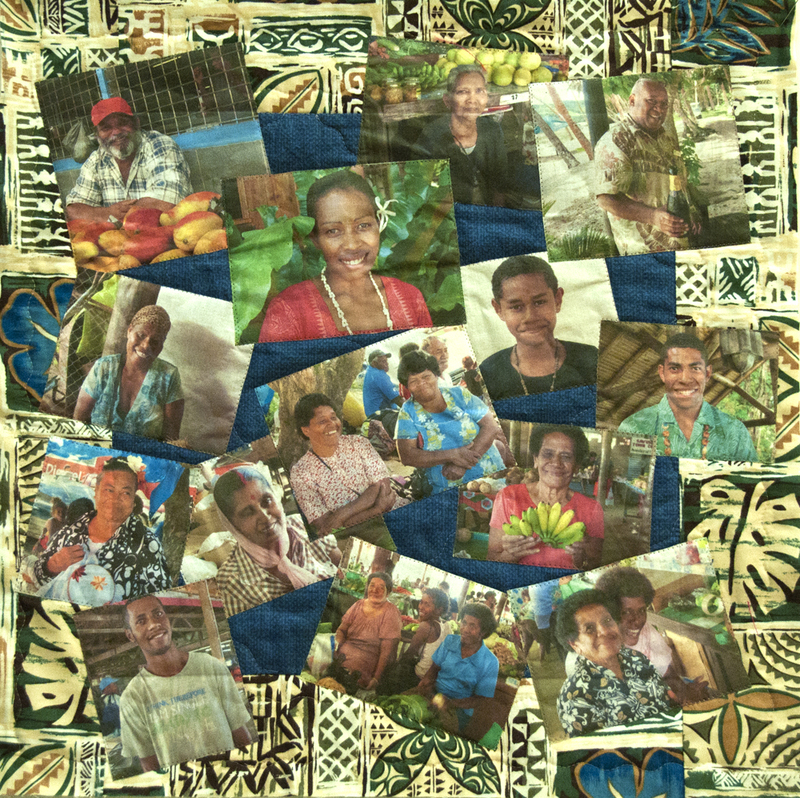 A number of the photographs were taken at the Public Market in Savusavu. This covered market provides facilities for farmers to sell their crops, fruit, vegetables and kava. Fisherman also sell their catch at this market. All the photographs were taken with the subjects’ permission, and they invariably thanked us for taking their picture. Made from commercial cotton fabrics, photographs transferred onto cotton lawn, cotton batting and threads. The techniques used are raw edge machine applique and machine quilting. Susan, a lovely reminder that true happiness is birthed from within. Thank you! An interesting way to treat the subject. They really look Happy ! A wonderful personal happy memory! 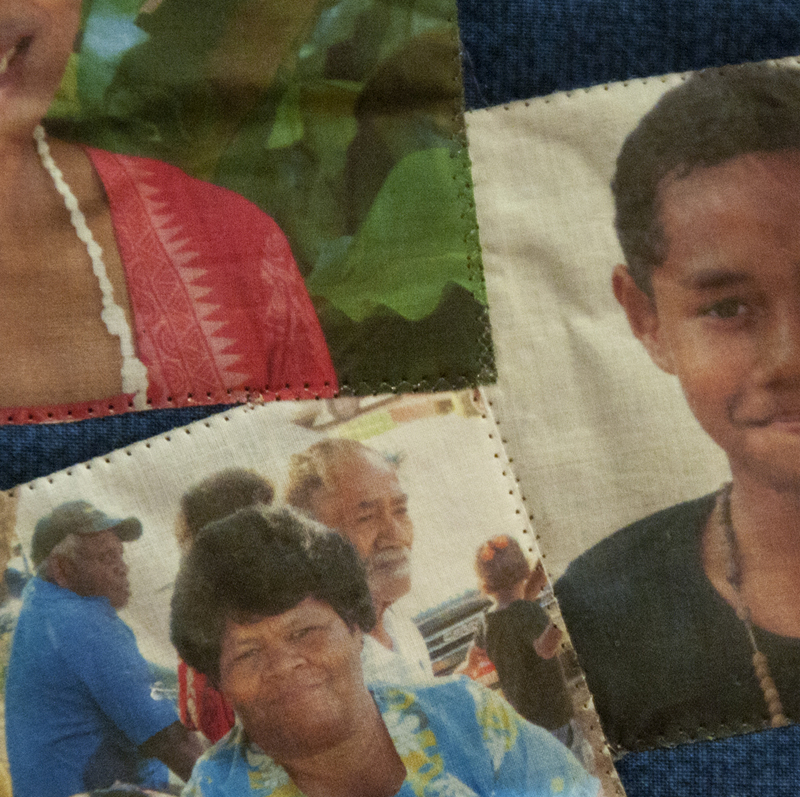 So many happy people make a happy quilt.